Fukuoka: Teen wing Yoshikazu Fujita scored an HSBC A5N Top 5 record six tries on his debut and fullback Ayumu Goromaru had another 30-point day as Japan hammered the UAE 106-3 at Fukuoka's Level-5 Stadium on Saturday. The victory — Japan's 18th straight bonus-point win in the HSBC Asian Five Nations — wasn't quite as big as last year's 111-0 win in Dubai. But this was a young Japanese team with four debutants. Yusaku Kuwazuru marked his first game for the Brave Blossoms with a brace of tries after coming off the bench at halftime and Kaito Morikawa also scored on debut. Flanker Daiki Hashimoto was the only one of the four new caps not to get his name on a crowded scoresheet. "I was really happy with the second half," said Japan coach Eddie Jones. "We fixed the breakdown a little bit and got our shape in attack. We looked like a team that can really improve." Fujita marked his first touch in international rugby with an amazing 80-metre run before being brought down short of the line. It was merely a sign of what was to come as Japan showed once again they had too much pace and power for their opponents. "Japan were very fast and showed great leg strength," said UAE coach Duncan Hall. "There was very little we could do to threaten their line. But we kept going to the end and were very honourable." Harumichi Tatekawa scored the opening try in the fifth minute, before Fujita bagged the first of his six. Goromaru added the extras and then weighed in with two tries of his own. The fullback was replaced in the 59th minute with the brace of tries and 10 conversions (from 11 attempts) to his name. Yuta Mochizuki and Tomohiro Senba also crossed for the hosts before Murray Strang got the visitors on the board just before the break with a penalty. Kuwazuru's international career was just 100 seconds old when he scored Japan's opening try in the second half. And from there on in it was just a matter of whether Japan could break a 100 and pass last year's winning margin. Hitoshi Ono, Takeshi Kizu, Morikawa and Kuwazuru all touched down, but the second half was all about Fujita. The 18-year-old went to school in Fukuoka and delighted his hometown fans with a further four tries to wrap up an amazing debut. "I think he enjoyed himself," said Jones. "But then if I scored six tries in my first test match I would be happy too." Saturday's results leave Japan firmly at the top of the table with two wins from two matches. Japan has maintained their perfect A5N record with 18 wins and 18 bonus points from 18 matches. 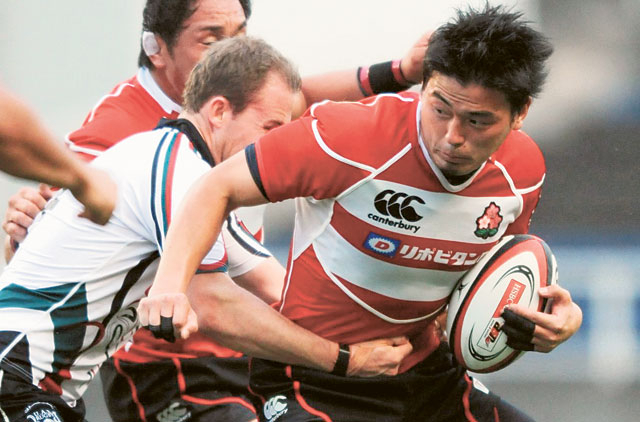 Japan top the HSBC A5N 2012 Top 5 table with 12 points. Hong Kong, who earned a bonus point from today's loss within seven points, narrowly holds onto second place with seven points, followed by Korea on five points. UAE and Kazakhstan have yet to record a point on this year's table.